First off: drink a glass of water before eating. It's one thing to say "I'll only have two slices of pizza" and another to act on it (and not eat the whole thing). Portion control is extremely difficult, let's face it, and those large restaurant and takeaway servings don't help either. 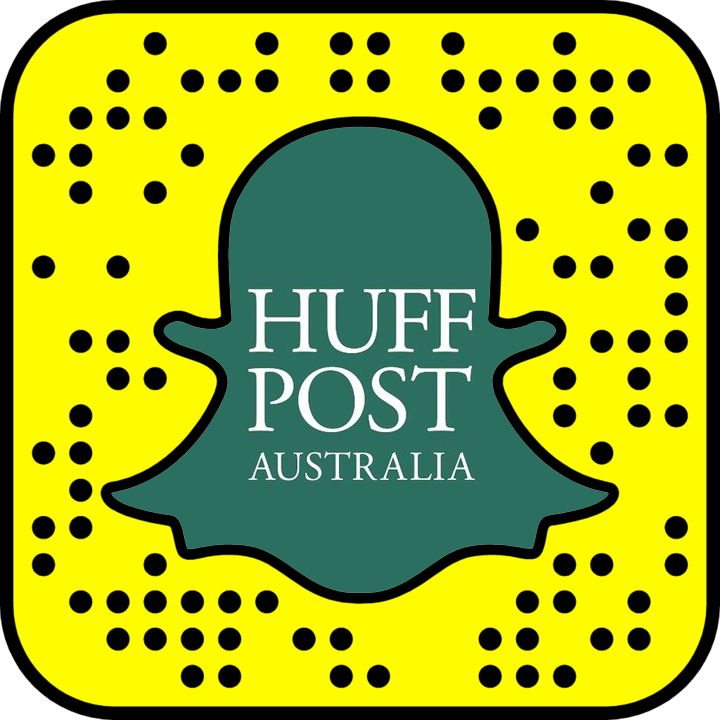 "Portion control is actually the cornerstone of good nutrition, other than making sure that you're making healthy food choices," accredited practising dietitian Chloe McLeod told HuffPost Australia. "It definitely is possible to overdo [a healthy food or meal] by having too big a portion size than your body really needs. 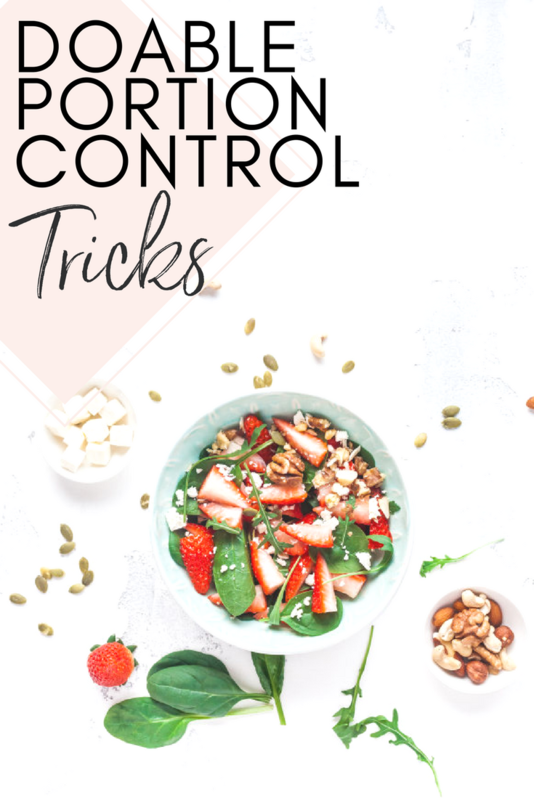 Some really common examples of these foods that people find easy to overdo are things like peanut butter, salmon (because it comes in such big fillets) and yoghurt." Portion control is not just important from a weight loss or management perspective, but also in respect to one's relationship with food. "If you consistently overeat, even if it's healthy food, it tends to leave you feeling a bit tired and sluggish. 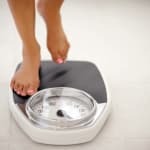 And, of course, it can make it harder to manage your weight." 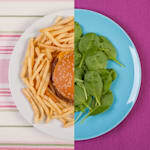 "Portion control is not just important from a weight loss or management perspective, but also in respect to one's relationship with food," Bingley-Pullin said. "If we are unable to stop eating once satisfied, we can be left feeling guilty and uncomfortable. Such guilt and discomfort can make us see food in a negative light and cause us to restrict food. This restriction then creates feelings of deprivation and leads to more overeating, perpetuating a poor relationship with food and feelings of loss of control." To help control portions and form healthier eating habits, follow these eight doable portion control tips. "One of my favourite tricks it to drink a glass of water about half an hour before your meal, or before anytime that you're eating," McLeod said. "This is because when you're dehydrated, you're more likely to eat extra. By having that big glass of water, it means you're getting enough water in, but also you're less likely to have too big a portion size." If you're going to be overeating anything, eating veggies is the best option, McLeod explained. "Fill up your plate with vegetables first. 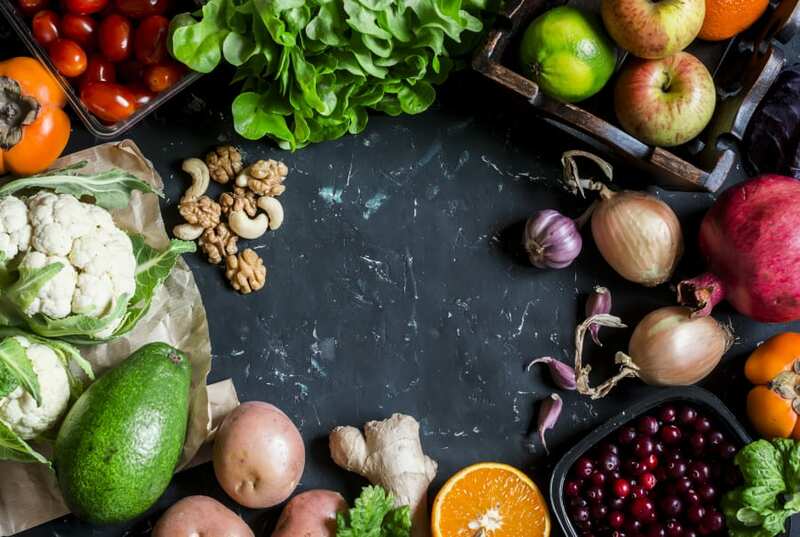 You're more likely to hit that minimum of five serves of vegetables a day, and the vegetables are really low in calories, but rich in fibre and other micronutrients and polyphenols. That's really useful to help with maintaining your health," McLeod said. Nutritionist Fiona Tuck recommends focusing on non-starchy greens when it comes to filling your plate. "Eat as much green salad (such as greens, lettuce, rocket, cucumber and zucchini) as you like to bulk up the meal," Tuck told HuffPost Australia. "Add herbs for flavouring but keep oil, protein and carbohydrates to the recommended portion size." 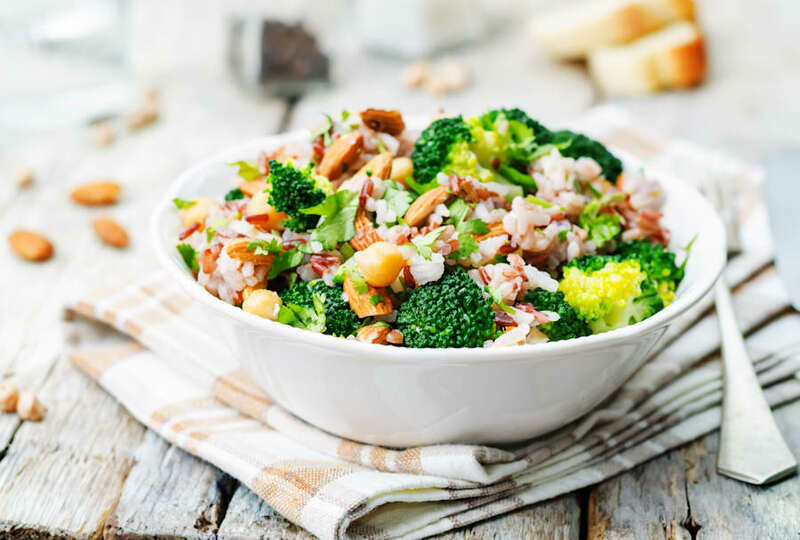 "Divide the plate into half a plate of low starch vegetables, a quarter plate of protein, a quarter plate of complex carbs with half a tablespoon of fat," Bingley-Pullin said. 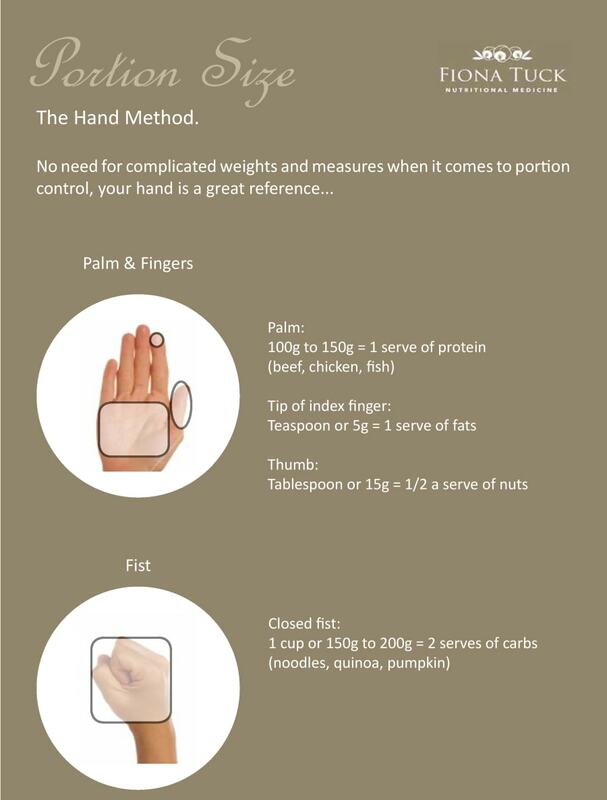 Alternatively, or to use in conjunction with the plate rule, use your palm to 'measure' out appropriate portions. "Remember to keep protein the size of the palm of your hand, the tip of the finger as serve size of butter, a quarter of an avocado per serve and no more than the size of a match box for cheese," Tuck said. Although it may not seem like much food, once you portion out the food in those deceptively small containers, you will realise the actual quantity inside. "Portion out a serving of food and place on the plate, instead of eating from a packet or straight from a container," Bingley-Pullin said. "It's likely you will feel satisfied after the first serve and, in the long run, eat less compared to eating straight from the packet." "If you're prone to overeating, portion aside one-third of your meal and know that you can eat it later on if hungry. Hunger can take 20-30 minutes to set in," Bingley-Pullin said. By the time that 20 minutes has rolled around, chances are you'll be satisfied and full enough to not require that last third. Here's the plate rule in action. To help you get a feel for what a serve of, say, carbohydrates are, use a measuring cup a few times. "You don't have to do this one every single time, but occasionally measure out some portion sizes so that you know what a serve looks like," McLeod said. "For example, if you're putting muesli in a bowl or leftovers from dinner into a lunch container, just measure out how much you're having so you can see what it looks like." "Keep a half cup measure handy and use to measure out a portion of cooked rice or pasta," Fiona added. 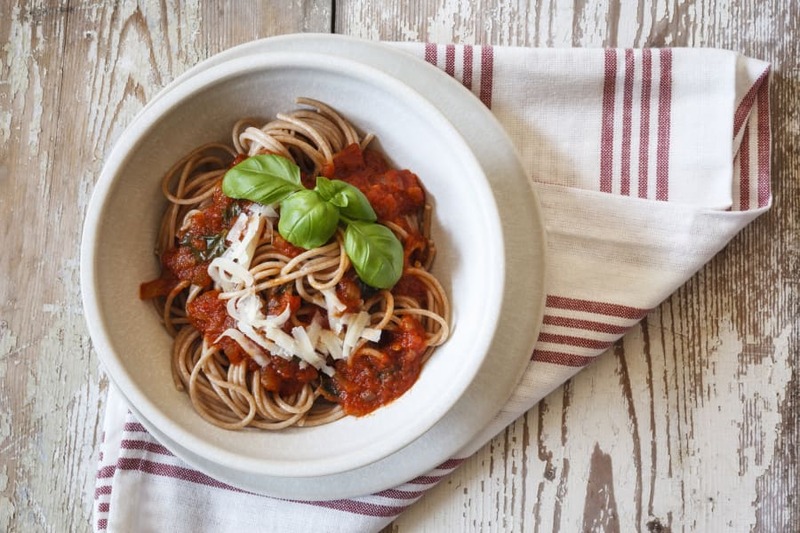 Think about it: a normal serving of pasta looks way smaller when it's served on a huge plate -- meaning we're more likely to feel unsatisfied after eating. "If the plate is really big or small, or if the bowls are bigger than you're used to, it's really easy for your brain to get a bit confused. 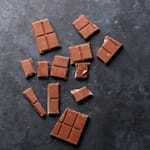 You think you're having the same amount but you're having more because of that portion distortion," McLeod explained. A standard serving of pasta can look (and feel) way smaller in a large bowl. "Eating fast means that you're more likely to miss your hunger and fullness cues. 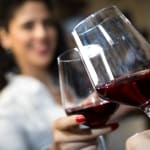 Taking your time with a meal, really savouring each bite, helps you to enjoy the meal more and helps make sure you don't overdo how much you're eating," McLeod said. That means no standing over the kitchen bench or wolfing down dinner in front of the TV. "Always sit to eat and eat mindfully. Food will seem less satisfying when eaten in a rush," Bingley-Pullin added. And remember: don't compare yourself to others when it comes to portion sizes. 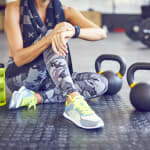 If you exercise frequently or have a fast metabolism, your energy needs will be different. "Everyone's needs are different and we shouldn't use other people's eating habits as a guide for your own, as this can lead to over or undereating." To make these portion controlled meals more filling, remember to ensure meals are balanced in terms of macronutrients -- a source of protein, healthy fats and complex carbs. "Include low GI carbohydrates like chickpeas, lentils, barley, brown rice, quinoa and sweet potato. 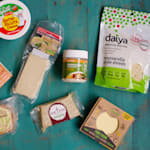 They are all wonderful sources of carbohydrate foods which digest slowly and give you energy for a long time," McLeod said. "Include healthy fats such as avocado, nuts, seeds and olive oil because the fat helps us stay more satisfied, plus it's really good for your skin, hair and body. 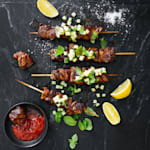 "And, of course, good quality protein like chicken, sustainably-caught fish and leaner cuts of beef and lamb which have been grass-fed, if possible. That helps improve the composition of the fatty acids the meat contains." For vegetarian sources of protein, stick to legumes, tofu and tempeh. "Things like legumes (chickpeas, lentils, cannellini beans) aren't just a good source of carbohydrates, they double up and are a really good source of protein, too," McLeod said. "Tofu, quinoa, tempeh and different nuts and seeds are other good sources of plant-based protein, as well."